Sauce is most definitely on the menu with our cheeky Valentine's card! Let your Valentine know that naughty shenanigans are on the table by serving up this funny card. 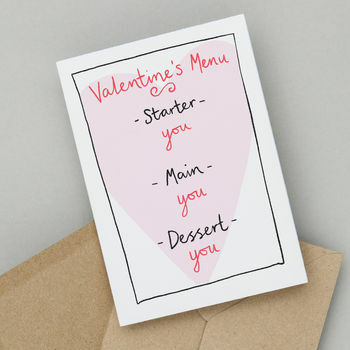 The card features a Valentine's menu reading "Starter - you, Main - you, Dessert - you ". Funny Valentine Card & Rude Cards - exclusive to so close studio. This cheeky card designed and printed in our Devon studio. Printed on 300gsm matt card, supplied with an envelope and packed in a clear cellophane. DESIGNED, PRINTED AND PACKED BY SO CLOSE STUDIO, DEVON, UK. A6 size - 105mm by 148mm.